Julie Pierre’s idea was simple, but brilliant. Find a few neighbors with empty backyards, and start growing food. Give each homeowner fresh produce, in exchange for the use of their space. Sell the rest to people who are passionate about local food. It’s community-supported agriculture, with a twist: The farm is in suburban backyards. Pierre established Our Yards Farm in the spring of 2015, and she has since turned backyard farming into a booming business. By mid-September 2016 she had already harvested about 3,000 pounds of food from 12 yards that total just 1/4 acre of space. From these roughly 10,000 square feet she has helped feed 45 CSA members, plus she sells at two or three farmers markets each week and supplies a local restaurant when she has a surplus. She has been featured in several news stories and had a starring role in YardFarmers, a documentary series that follows six young Americans who move home with their parents to become yardfarmers. One veggie at a time, she is changing the way Americans think about where food comes from, who grows it, and how it gets to our tables. Alfrea sat down with Pierre to talk about how she got started backyard farming. Here’s her exclusive expert guide. Pierre was surprised to discover how many people were interested in sharing their land and supporting her project. 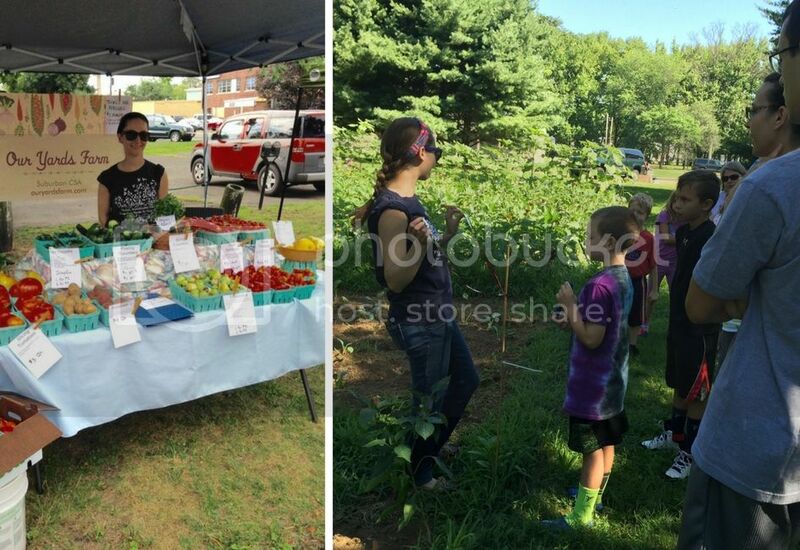 “The first year I made a little website, and I just put it out on social media and said: ‘Hey everybody, I’m starting a farm, I’m looking for land!’” Local newspapers wrote stories, and news circulated around the community through a few moms’ groups on Facebook. Pierre put out the word in October, and by March she had narrowed it down to 10 big, sunny spaces. Instead of approaching people and asking if she could farm on their property, Pierre waited for people to volunteer their backyards. She was looking for kindred spirits who understood the concept of an urban, backyard CSA. In once case, a homeowner who shares land with Our Yards Farm works from home. When Pierre comes to weed the plot, he comes out to visit, munches a cherry tomato and asks how it’s going. “It’s a two-way street, and we’re both benefitting,” she said. “They want this experience, too. Is it close to other gardens you’re managing? “If it’s an extra 20 minutes away, and I’m there two or three times a week, that adds up,” Pierre said. When she started out, Pierre tried to make her gardens beautiful so they wouldn’t draw criticism. She quickly learned that a working farm doesn’t look like a photo shoot in Better Homes and Gardens. She is concerned with how much food a garden is producing – not how it looks. “It’s important to talk to each other, make sure you understand each other, make sure that you’re on the same page,” she said. “If they currently have a lawn company spraying pesticides, it might be a more difficult relationship, because they might be used to a certain aesthetic, and they might not understand why they have to stop using herbicides,” Pierre said. Pierre operates a backyard CSA, so the people who lend their land get a discount commensurate with the size of the space. Other backyard farmers use a different model. For example, Kelowna, B.C.-based urban farmer Chris Stone of Green City Acres gives homeowners a basket of food during the growing season, but sells the rest of his produce to restaurants and at farmers markets. a promise not to use chemicals on the property while the farm is in operation. Pierre currently signs one-year contracts with homeowners, but after two people moved mid-way through the season, she is considering multi-year contracts in the future. Get started! It could change your life. We asked Pierre how Our Yards Farm has changed her. “It has changed everything,” she said. “It has affected every aspect of my life. When I was younger, I always wanted to do something that would have a positive impact. I could never pinpoint it, I just wanted to do good. She still struggles sometimes, but most of the time she loves what she does. If you’re thinking of getting started in backyard farming, Pierre’s advice is simple. “I would say, just do it. People are intimidated by gardening. We’re somewhat disconnected, because so few of us grew up with gardens in our backyards. “But the plants want to grow, they’re meant to grow, they’re meant to produce fruits and veggies. We have our failures – that’s inevitable – but you’re going to have success, too.